At GoCustomized, you now have the opportunity to give your phone a unique look and stand out from the crowd by designing a Samsung Alpha custom case. We offer you all the tools you need to create your unique phone case. Customizing your Samsung Galaxy Alpha photo case is a very simple and quick process. First, you have to choose the phone case type that fits your needs the most. Are you looking for a basic hard or soft case or do you prefer a more functional wallet case? We also offer a full wrap hard case with the print of your design on the back as well as on the sides of the case. 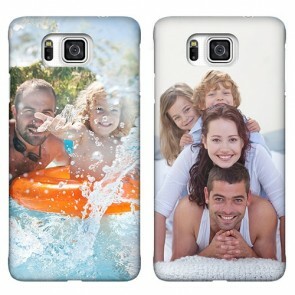 After choosing the perfect case type you can upload your favorite photo or choose one of our pre-made designs. Add a text, quote, or date to make your design even more unique. 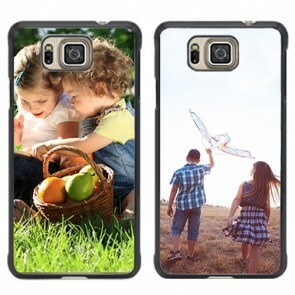 What do you think about giving a Samsung Alpha custom case to a loved one? It's a great gift idea for various occasions. Customizing your Samsung Galaxy Alpha photo case only takes a few minutes and guarantees a high-quality phone case for optimal protection. Start now! It is important to adequately protect valuable items from damage. Therefore, you should consider protecting your phone in the best possible way with our Samsung Galaxy Alpha photo case. At GoCustomized, you can now design your own custom phone case to protect your cell phone in a unique way. With our user-friendly customizer, everyone has the opportunity to make their own Samsung Alpha custom case. Simply upload your favorite picture or use one of our pre-made designs and add a text, filter, or logo. All of our custom phone cases are made of high-quality materials and your design will be printed on the phone case using UV printers with scratch-resistant ink to ensure a great print result. Thanks to the design of our Samsung Galaxy Alpha photo case all buttons and features of your cell phone remain accessible. By customizing a Samsung Alpha custom case you will finally get reliable phone protection that also matches your personality! As soon as we receive your order, our production team will take care of it so that your case will be produced and shipped within 24 hours of purchase. In this way, you will quickly receive your Samsung Alpha custom case so you can show it to your friends and family as soon as possible. You no longer have to choose between quality and aesthetics! Get it all-in-one by designing your own Samsung Galaxy Alpha photo case now!